During the last two weeks, I have received several emails from our readers, asking what the best time to photograph Maroon Bells is. I have been to Maroon Bells many times, so I would love to share some info on when to photograph the most popular location in Colorado (and one of the most photographed spots in the world). Maroon Bells is truly magical, the one place you can only appreciate when you are there. 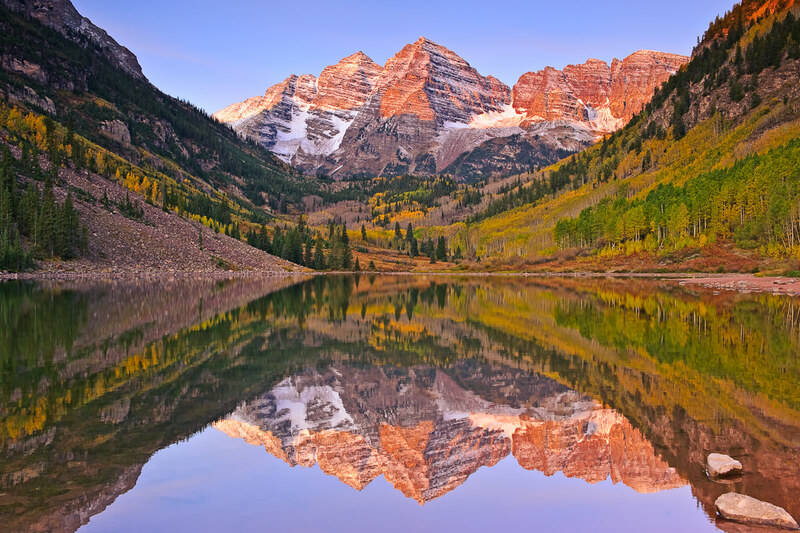 While photographs do show the beauty of Maroon Bells, they still cannot transfer the raw beauty of the place with its high altitude fresh air, the smell of wildflowers and plants, pleasant afternoon breezes, the ever-changing weather and freezing-cold nights and mornings. Maroon Bells changes drastically during seasons. In the spring (which is around late April and May), the water level of the Maroon Lake is high, the aspens have new leaves, with wildflowers and plants just starting to turn green. The summer is beautiful, with the busy streams and gorgeous wildflowers. The fall season is what draws the most amount of people to Maroon Bells, due to aspens rapidly changing their colors. If you are lucky, you might get some snow with aspens in their fall plumage. Winters are rather harsh, but still beautiful with fresh snow. The roads in winter are closed though, so you would have to rent a snowmobile to get to the lake. In terms of seasons, I personally like to visit Maroon Bells from mid-July to late September. Fall weekends are typically very busy and if you do not show up two to three hours earlier, you might not find any available parking. If you want to go there in the fall, I would go there Monday through Wednesday – those are the least busy days. 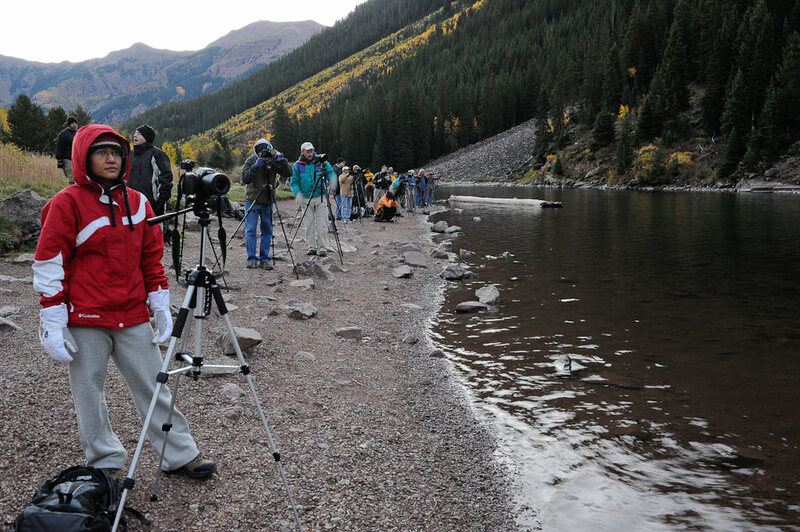 Starting from Thursday, it gets pretty packed with all local amateur photographers taking time-off to photograph the surrounding area and San Juan Mountains. But it will require some good technique and preferably fast glass + good high-ISO performance by your camera, if you do not want to see star trails. If you are looking for a guide on how to photograph landscapes, check out my landscape photography tips. Hope this helps. Good luck and let me know if you have any questions. Медвежутка, вот приедешь я ж тебя туда потащщщщу!!! Ты когда собираешься к нам а? Davay priyezjay letom…ustroim tur po Amerike! I was happy to find your site for information on Maroon Bells!! I’m trying to see if I can make a trip in the fall but will be travelling to Denver for business mid-May and was hoping you could provide me some help in planning for the trip. I was planning on leaving early and trying to make a trip to Maroon Bells on May 12 or 13. Is this a good time to be able to photograph at maroon bells? Are the roads open at this time?? If the roads are accessible, how busy is it at this time of the year? The other question I had was what is a good place to stay, so I can get there early enough for sunrise? Hello – I am curious what the best time to photograph here for a wedding ceremony would be – looking to book a ceremony at the Amphiteater. Any advice? I read your great article about Maroon Bells. I’ve never been before. Where is the “best” position on the lake to take the iconic image? Those campgrounds are impossible to stay at, unless you reserve months in advance! I would recommend to stay around the Aspen area and just drive there – it is a pretty short drive. Yes, the lake is easily accessible by car, but if you do not drive there way before sunrise, expect the parking lot to be full. Once it is full, there will be no option to get there aside from taking a bus. Yeah I see they are really busy. The only thing I am concerned about is that if I stay in the Aspen area, I might not be able to access the valley before 7AM. I really want to be ready to photograph long before sunrise,so will it be possible access the park at around 4AM? Did you drive in at an early time as well? Plans changed a bit. So I will now be there on wednesday and thursday (24th-25th July) . Thanks so much for your help! Do you mind sharing the date of your photographs posted above just to get an idea of when it could look similar? I know the variability depends on many things. I’m debating Sept 10-13th or 22-24th. Thanks in advance! 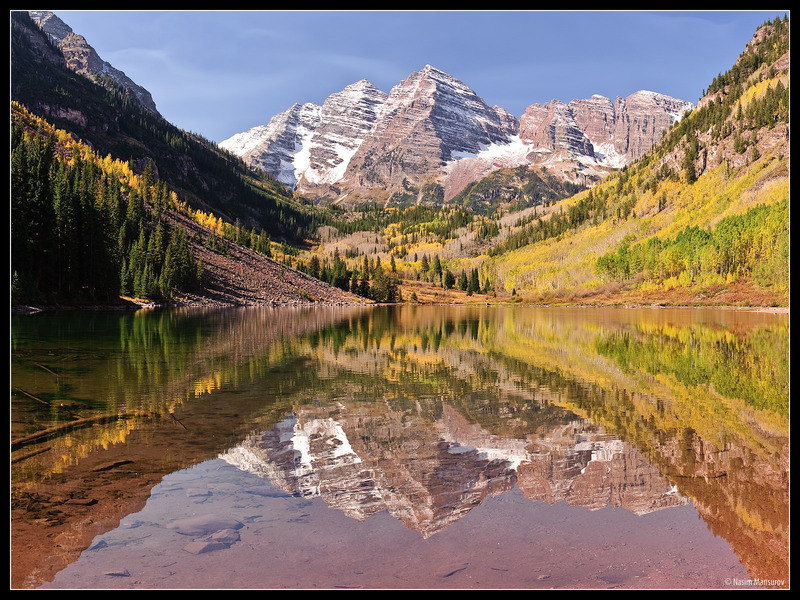 I am planning to visit the Maroon Bells and Denver area around the beginning of October. My schedule and dates are not flexible and the only time I can be at Maroon Bells for sunrise shot is on a Friday, something you advised against. But it is what it is. 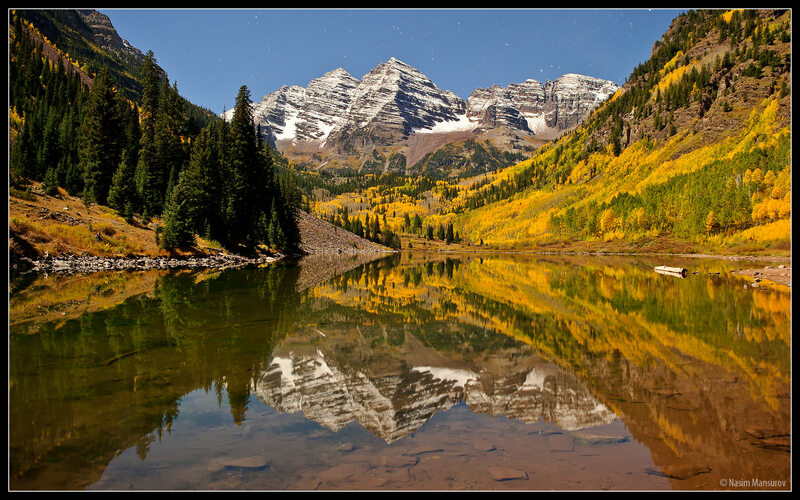 I will stay the Thursday night at Aspen and want to be at the Maroon Bells Lake area to photograph before sunrise. The sunrise will be around 7am. Someone told me that I should be there by 4am? Is that too early or can I be there by 5:30 to 6 am and still get a place to get a sunrise shot? 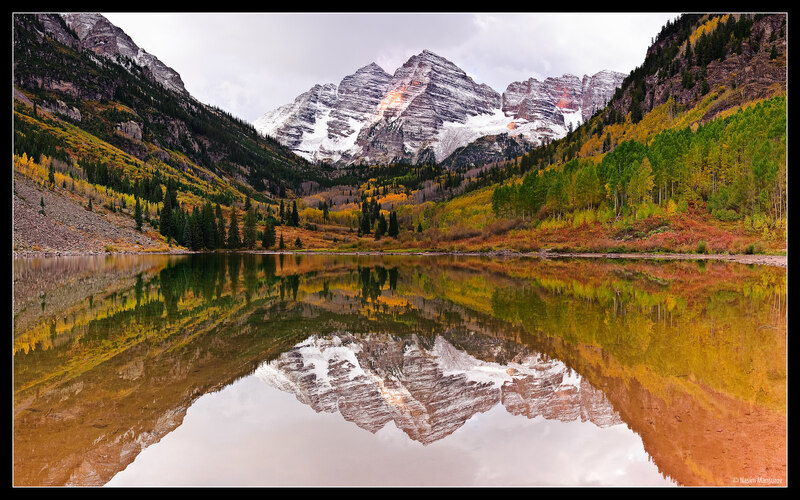 I was just at Maroon Bells on Monday, September 15, 2014, and Tuesday, September 16, 2014. 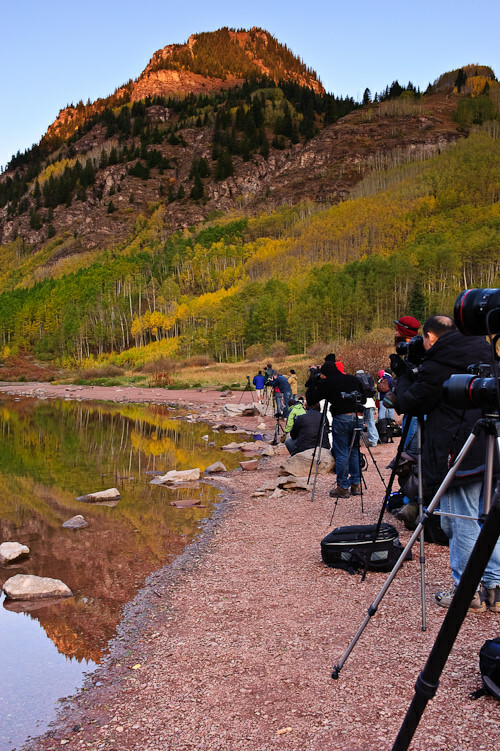 The author is correct… The sunrise is the best time to photograph the Maroon Bells! My friends and I arrived shortly before 6 AM on Tuesday morning. There was hardly anyone there. I got some lovely shots of the sun’s first rays hitting the peaks! Is maroon bell worth the trip in mid May? What should I expect?